In case you haven’t been in yelling distance of the state of Mississippi, the biggest news is that for the first time ever, both Ole Miss and Mississippi State are in the Top 5 with undefeated records six games into the college football season. It’s obvious from the paucity of preservation news this week that local newspapers and their readers are otherwise occupied, but there have been a few items of interest. Trumpet Records was the first record company in Mississippi to achieve national stature. The premiere releases by Mississippi blues legends Sonny Boy Williamson II, Elmore James and Willie Love appeared on Trumpet in 1951. Early Mississippi gospel and country artists also appeared on the Trumpet label. The impact of Trumpet Records on American music has been profound and lasting, but the site of the studio is rapidly decaying. The building that housed this jewel in the crown of Mississippi music has not only lost its luster, but it’s become a dilapidated shell. While the roof and walls are intact, they’re barren and pitted, covered with patches of peeling paint and without windows, open to the erosive elements of weather. Preservation efforts in the Farish neighborhood have been disappointing, but if you’re interested in helping in this project, head over to “Save Trumpet Records” and get involved. 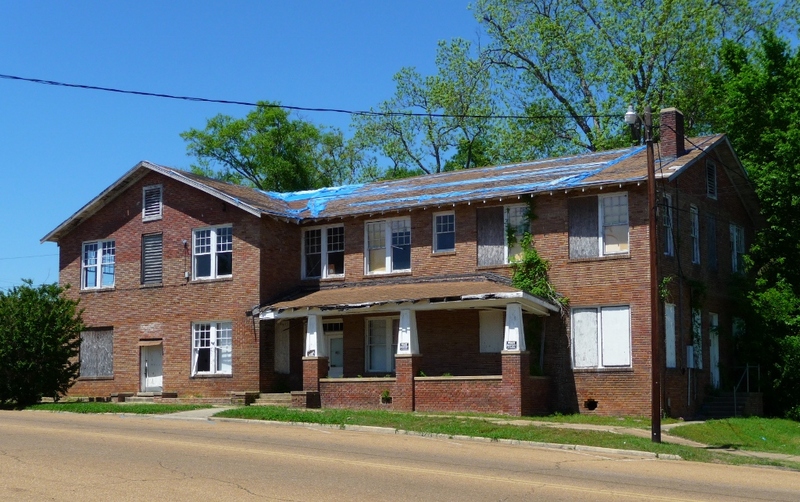 Millsaps Hotel, Hazlehurst (1918). Designated January 19, 2013. Daphine Foster, who serves on the board of the Calling Panther Foundation, reported at a recent meeting of the Copiah County Board of Supervisors that a good bit of work had been done on the inside of the building and next will come work on the roof. The Foundation also received approval from the supervisors for $20,000 and $44,000 from the city of Hazlehurst in matching funds. As many times as I drive by (and shudder at) that place each day and each week, I’ve yet to recall seeing any work done on it – inside or out. Speaking of renovation projects, the Facebook page of Preserve Marshall County shows some good before and after photos of the Holly Springs City Hall, after a recent cornice repair. Although never in the bad condition that the Millsaps Hotel is in, this Holly Springs project shows that with a little vision and a lot of hard work historic buildings can go from eyesore to beauty. For the past two years, Southern Studies students have helped to fill gaps in Mississippi interpretations of African American history by participating in the Behind the Big House (BTBH) program in Holly Springs, Mississippi. The program interprets the lives of the enslaved through extant former slave dwellings hidden in plain view. The dwellings were readapted for various uses—making it difficult to recognize their original purposes—and suppressed from historical memory, either unintentionally or by design. I haven’t been able to make it up to Holly Springs for pilgrimage in the last several years, but I’m looking forward to making it a priority this coming spring to see this ground-breaking approach to pilgrimage for myself. Finally, for the cemetery buffs among us, check out this presentation on “Modern Problems in Historic Cemeteries” by the National Center for Preservation Technology and Training (NCPTT, say that ten times fast). You can read the text at the NCPTT link above, or watch the 16-minute video here. I am excited to see the BTBH program, too. I met a member of the Preserve Marshall County group and she invited us to attend. On my to do list now! Thanks for the info on Trumpet Records! This is the first I’ve heard of it. However, the indiegogo campaign ended in March 2013 and it seems like everything I find is from last year. I hope we haven’t already let the treasure that is 309 Farish St disappear. Greenwood Volume III is due to be delivered today; do you want anything on these books for your blog?